Medicare is a federal health insurance program that provides health benefits to people who are 65 and older and to younger persons with disabilities. Are eligible for Social Security disability (SSDI) benefits and have End Stage Renal Disease (ESRD). You have lived in the United States continuously for at least five years. 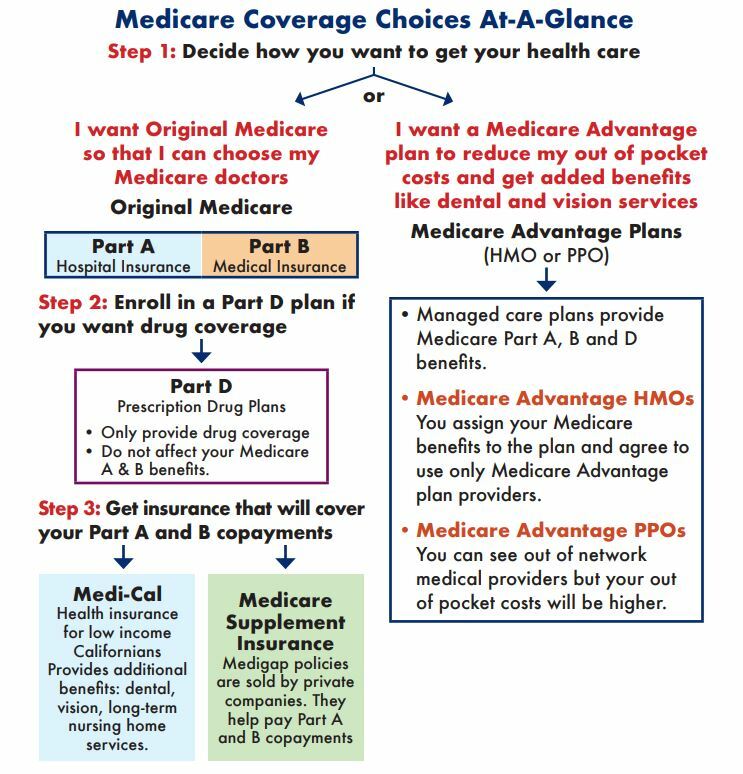 Persons who are not eligible for free Medicare Part A can purchase both Medicare Parts A and B or purchase Part B only. They cannot purchase Part A only. Call us at 1-800-824-0780 if you are not eligible for free Part A and have further questions. When do I apply for Medicare? You will generally apply for Medicare during your initial enrollment period. This 7 month period begins three months before your 65th birthday and continues for three months after. If you are already collecting Social Security Retirement Benefits, you do not have to apply separately for Medicare. You will receive your Medicare card in the mail before your 65th birthday. Persons who are eligible for Social Security disability benefits do not have to apply for Medicare. They are notified that they are eligible for Medicare shortly before completing the 24-month waiting period. If you miss your initial enrollment period, you can apply for Medicare during the general enrollment period. This period occurs during January through March of each year. The Medicare benefits are effective beginning July 1st of the same year. There may be a premium penalty assessed for late enrollment. Persons eligible for Medicare who are enrolled in an employer group health plan based on current employment status may delay their enrollment in Medicare. These individuals are eligible for a Special Enrollment Period (SEP) after they have stopped working. Only persons who have an employer group health plan through active employment qualify for the special enrollment period. Persons with COBRA or retiree coverage do not qualify for this special enrollment period and should not delay enrollment in Medicare. The SEP is an 8 enrollment period that begins on the first day of the month the beneficiary is no longer covered by an employer group health plan. What is the Medicare Part A premium? Medicare Part A is free if you are eligible for Social Security Retirement or Social Security Disability benefits. If you are not eligible for Social Security benefits, you must pay a premium for Medicare Part A. For more information on Medicare Part A premiums, see www.ssa.gov. Persons who voluntarily enroll into Part A are charged a 10% late enrollment penalty if the enroll 12 months or more earlier after their initial enrollment period (IEP). The penalty is based on the number of 12-month periods that enrollment is late and is in effect for twice the number of years enrollment was delayed. Example: Amy is not eligible for free Part A and did not enroll into Part A before her initial enrollment period (IEP) ended on May 31, 2010. She later enrolled in Part A during the 2013 general enrollment period (GEP) which ended on March 31, 2013, 34 months after her IEP ended. There are two 12-month periods or two years between the end of her IEP and the end of the enrollment period during which she finally enrolled in Part A. Amy is assessed two year 10% late enrollment penalty for twice the number of years she was late, or 48 months. What is the Medicare Part B premium? 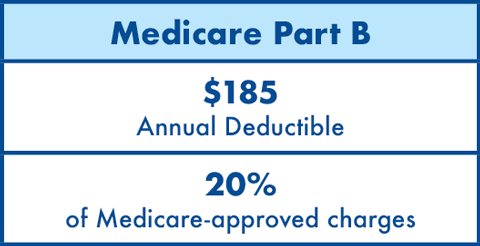 In 2019, most Medicare beneficiaries pay the standard Part B premium of $135.50/month. About 3.5% of Medicare beneficiaries pay less than $135.50/month for the Medicare Part B premium. These individuals pay less for Part B because the 2019 cost of living increase in their Social Security benefits was not large enough to cover the full cost of the Part B premium increase. High income Medicare beneficiaries who pay an income related surcharge for Part B coverage in addition to the standard Part B premium. If your annual income is higher than $85,000/year (individual), or $170,000/year (married couple), you will pay the base Part B premium of $135.50/month and an additional income-related amount that is based on your income. This is called the income-related monthly adjustment amount (IRMAA). For more information on the IRMAA, see http://www.ssa.gov/pubs/EN-05-10536.pdf. Persons who enroll in Medicare Part B after their initial enrollment period (IEP) has ended may be assessed a late enrollment penalty unless they qualify for a Part B special enrollment period. The Part B late enrollment penalty is 10% of the Part B premium for every 12 month period you delayed enrollment and is in effect for life. Example: Sam did not enroll into Part B before his IEP ended on May 31, 2013. He enrolled in Part B during the 2016 GEP which ended on March 31, 2016, 34 months after his IEP ended. Because two full 12-month periods passed between the end of his IEP and the end of the GEP during which he enrolled in Part B, Sam will have a lifetime Part B late enrollment penalty of 20%. Medicare covers up to 90 days of hospital services each “benefit period” and an additional 60 “lifetime reserve” days that can be used only once. A “benefit period” begins when you are admitted to the hospital and ends when you have been out of the hospital or have not received Medicare covered skilled care in a nursing facility for 60 consecutive days. Medicare provides up to 100 days of daily skilled nursing care, after a three day prior hospitalization in each benefit period. A “benefit period” begins the day you are admitted to the hospital and ends when you have been out of the hospital or nursing facility for 60 consecutive days. The 60 “lifetime reserve days” can be used only once. Your doctor has prepared a plan of care. Medicare will pay for services by an approved hospice program if a doctor certifies that you are terminally ill (expected to have less than six months to live). You select the hospice benefit which provides palliative care over receiving curative care through the standard Medicare benefit. The goal of hospice is to provide terminally ill patients with patient centered care that optimizes quality of life. For more information on the Medicare hospice benefit, see https://www.medicare.gov/Pubs/pdf/02154-Medicare-Hospice-Benefits.PDF. Medicare assignment is an agreement between your health care provider and Medicare that limits your provider’s charge to the Medicare “approved” amount. When your health care provider agrees to accept Medicare assignment, s/he agrees to charge you no more than the Medicare approved amount. What do I pay when my provider accepts assignment? If your health care provider accepts assignment, they can only charge you the Medicare deductibles and coinsurance for Medicare-covered services. This means you are responsible for your annual Part B deductible and the 20% Medicare Part B coinsurance when you receive Part B services. Do all Medicare providers accept Medicare assignment? Medicare providers who accept Medicare assignment 100% of the time are “Participating Providers.” Ask your Medicare provider if the are a participating provider. You can also find a participating provider by visiting the Medicare website, www.medicare.gov/physiciancompare. If your Medicare provider is not a participating provider, they can still accept Medicare assignment on a case-by-case basis. Ask your provider if they will accept assignment before a claim for your services is submitted to Medicare. What do I pay if my provider does not accept assignment? How do I know if Medicare has paid for my medical services? how much you owe for each claim. If Medicare denies payment for a particular service, the MSN will have information about your appeal rights. 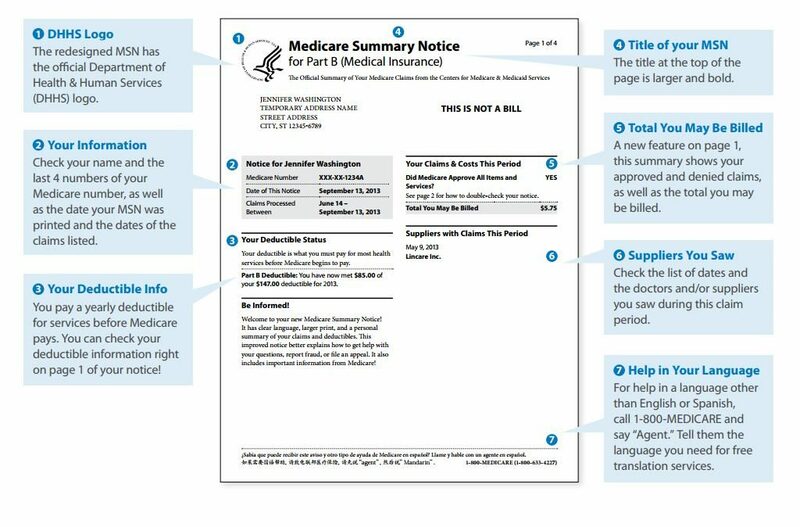 If you are enrolled in a Medicare Advantage plan, you will not receive Medicare Summary Notices from Medicare. What does a MSN look like? Yes. See Medicare Part D section. Can I supplement my Medicare benefits? What are my options? Yes, there are several ways you can supplement your Medicare benefits. For more information on your options, see Medicare Financial Assistance Programs. Are there any financial assistance programs that can help me pay my Medicare premiums or co-payments? Yes. For more information, see Medi-Cal Benefits and Coverage and Medicare Financial Assistance Programs.